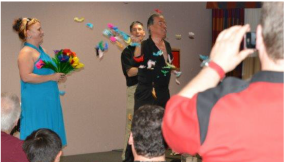 Make your Event Unforgettable with Magic! Is it Illusion? Is it Delusion? 11 theater & festival shows in Singapore including one for the President. World Clown Convention (6 times) NYC, Orlando, Chicago, Denver, Albuquerque and Winnipeg. Reviewed in M.U.M. Magazine - Society of American Magicians. "Norm burst into character as his hilarious creation “Normando,”(sic) a fictional egotist for whom taking an aspirin would deserve a standing ovation. He couldn’t have been funnier." - Bob Forrest - Writing review of S.A.M.C.O.N. XI Convention in M.U.M. Magazine - Society of American Magicians. 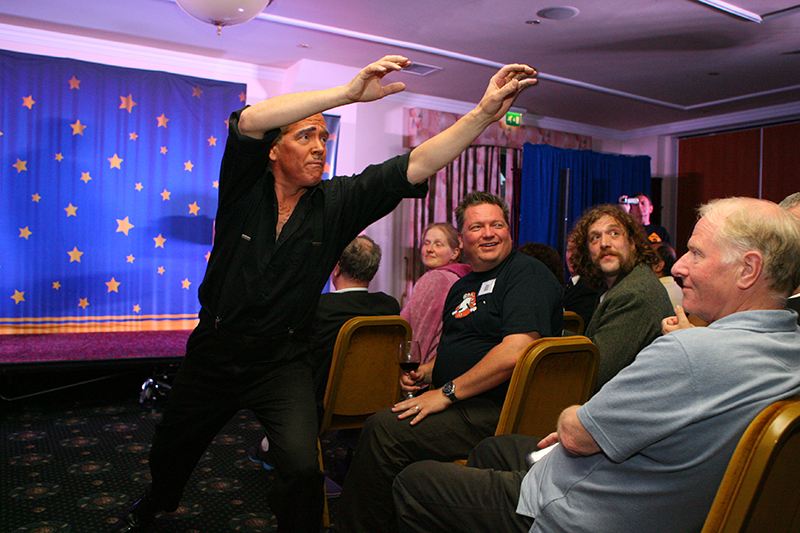 The Amazing Normondo the Great stunned audiences in Great Brittan with Magic and the Powers of the Mind. "I actually HATE Normando, it took months for the stitches in my face to heal because I was laughing so hard. I honestly thought I had done myself a real injury, I was convinced I had a hernia, but after extensive medical tests the doctors concluded that Normando has made me use more laughter muscles than ever before. On a serious note, funny, madcap, zany and nuts…that’s Normando!" 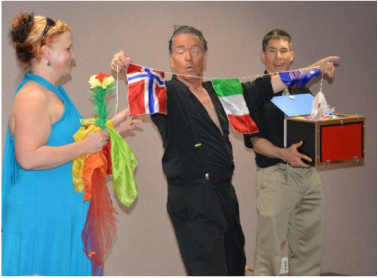 Here is the fastest way to discover how Normondo the Great can add fun to your convention or Event. Just pick up a telephone and dial ... its just that easy! Normondo Gives Gracious Canadians the Magic!! "You are one of our most favorite entertainers! Normondo is still with us." Live on stage at the Celebrity Room of the Fabulous Holiday Inn in Davenport, Iowa! Its Magic!! 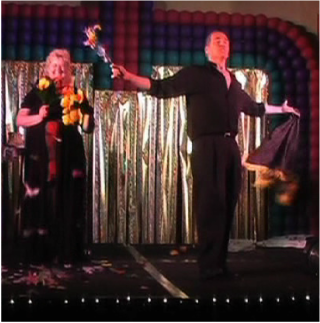 In October 2014 Midwest Comedy Clown Convention had Normondo attempt a show. 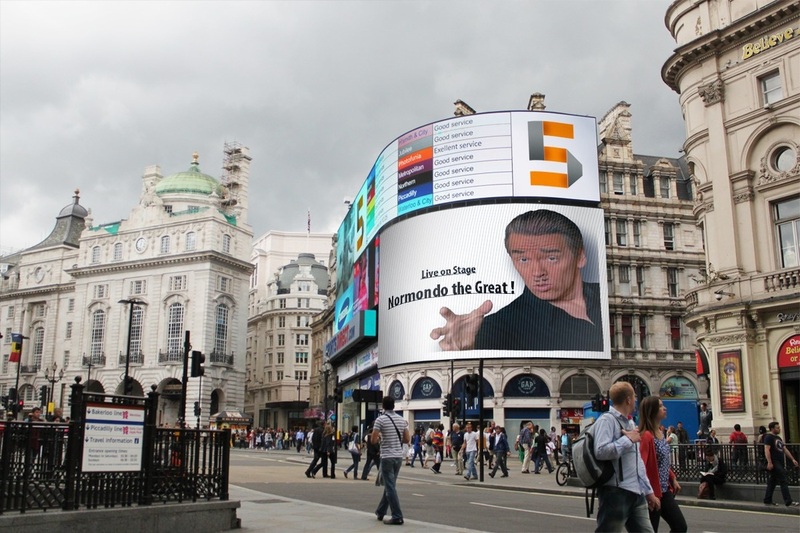 "Normondo is a pro - pro-fessionally funny - he knows what an audience wants and gives it to them! 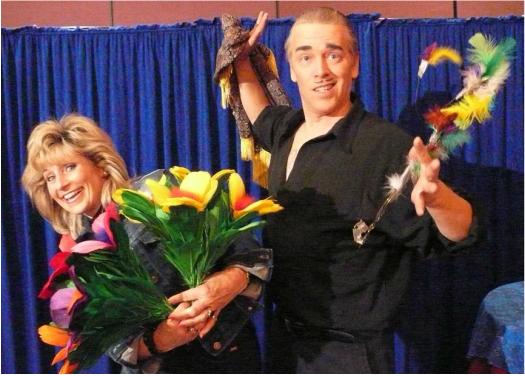 Fun to work with and a fabulous entertainer!" Rick Fisher, president, FAB Magic, Colon, Michigan - The Magic Capital of the World! 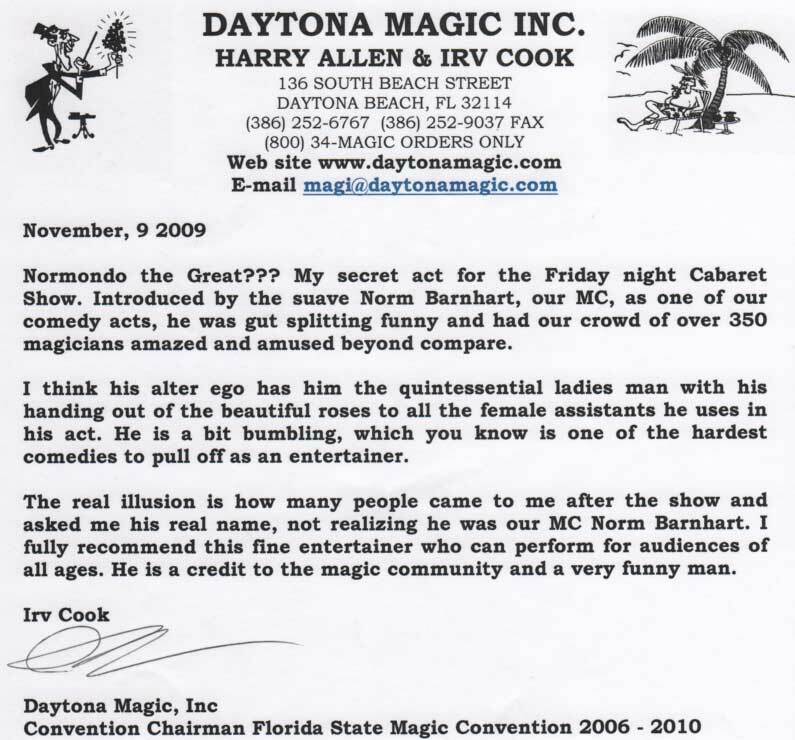 "Norm recently performed at the FAB Magic Celebration in Colon, Michigan. This was a 4 day convention of Magicians, by Magicians. Experience ranged from the newest apprentice to 60+ years in the entertainment business. I personally watched Norm comfortably interact with them all. Each day consisted of multiple seminars, Norm's included, with an evening performance highlighted by some of the biggest names in the business, Normondo's act ranked among the best in my opinion. I was fortunate enough to interact with every Magician in attendance, and feel that Norm is an incredible talent, comedian, gifted top notch magician. You can be assured of a great experience, and a performance you will not be able to forget." 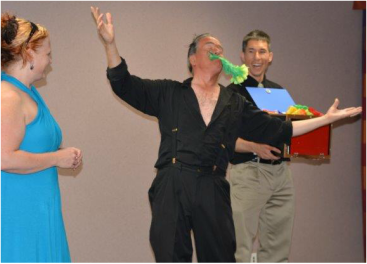 We are concerned that the above magician may have confused Normondo with another act, but we think he liked it. What are you waiting for? Get some Magic! Normondo played his part in over a dozen shows across SIngapore. 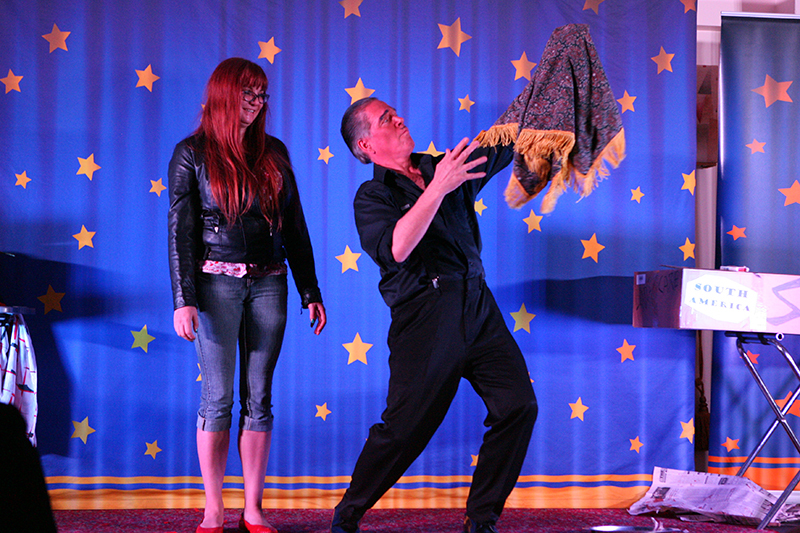 Included in the show were Ventriloquist Dave Michell, Ringling Great Kenny Ahern, and these two hilarious world traveled clowns from Japan the one and only Roni & Gigi. At the International Brotherhood of Magicians event in Singapore. Normondo In SIngapore! Norm lectured 1st . . . then came Normondo! From the I.B.M. Ring #155 Report: "After the interval, we were surprised to see a different person at the front. We thought Norm had brought his brother or his friend along to continue with the remaining part of the lecture. Actually, this was the third segment of his lecture. 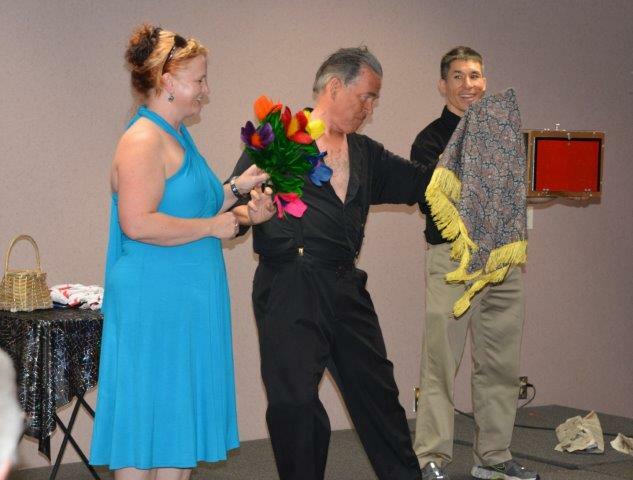 Completely transformed to a character known as the Amazing Normondo, Norm gave us his award-winning act that won him the coveted 1st place as America ’s Funniest Magician in Las Vegas . It was not recommended to laugh too hard after food and drinks, but we could not help it. We were in stitches at the bumbling antics of this fall-apart comedy act that featured a proud Las Vegas magician who was having an off-evening." See full review on workshops page of this site.. .